Application maintenance giving you a headache? Struggling to keep up with it? Worried that you aren’t doing enough? Application maintenance is difficult and requires constant vigilance, but even if you are careful, there are still mistakes that you could be making. 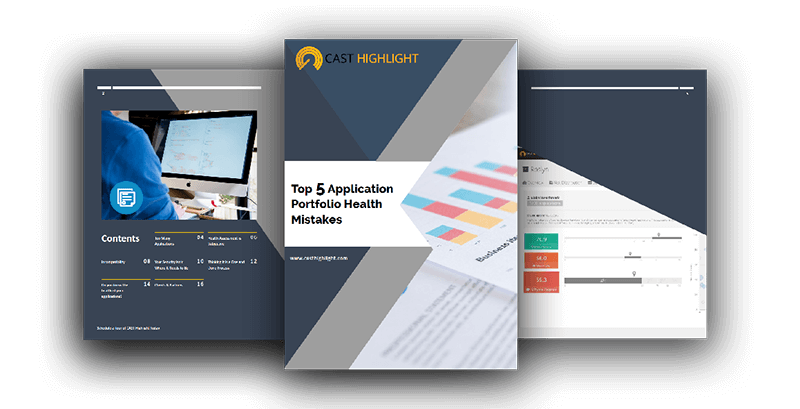 Our eBook, Top 5 Application Portfolio Health Mistakes, can help you to avoid any of the common mistakes people make when monitoring their application health. Download Top 5 Application Portfolio Health Mistakes Now. Application portfolio health is the key for IT software management – no matter the size of your business of company. In order to stay on top of your performance, you need to measure the metrics and performance of your software, but that isn’t enough. In fact, many people make mistakes in reading the metrics or putting them to use. Mistakes can happen at any phase of the process, but there are a few mistakes that can (and will) derail you completely. Get CAST Highlight’s free eBook to find out more about these mistakes and, even better, how you can avoid them. Download Top 5 Application Portfolio Health Mistakes today! You’ll be surprised how many of these mistakes you may be on the verge of making.